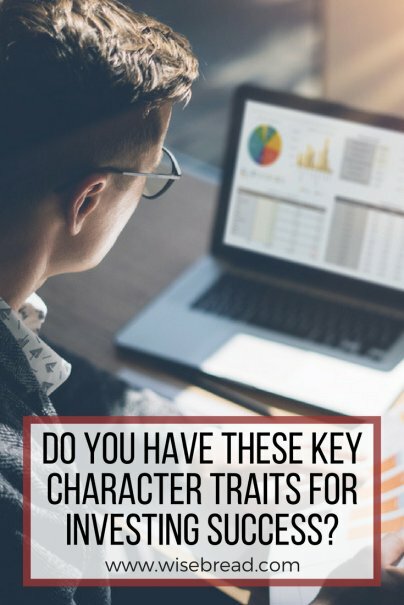 Home » Personal Finance » Investment » Do You Have These Key Character Traits for Investing Success? Warren Buffett, the Oracle of Omaha, summed up the key to investing success like this: "Once you have ordinary intelligence, what you need is the temperament to control the urges that get other people into trouble in investing." Let's say you and I have ordinary intelligence and want to improve our investing chops. What are the traits that make for a great investor? Hollywood is awash with stories of money men who live by this mantra: "Greed is good." The Gordon Gekko character is burned into our collective memories for life. From The Boiler Room to The Wolf of Wall Street, we get it — the industry is full of sharks. It turns out, sharkiness may work against you in the world of finance. A study published by the Society for Personality and Social Psychology looked at the behavior of hedge fund managers over a decade. Managers with psychopathic, narcissistic, or Machiavellian personalities underperformed their peers by 1 percent annually. Over time, their ruthless approach to decision making added up to notable losses. Some people avoid investing altogether because they believe they'll never succeed at it. That mentality can become a self-fulfilling prophecy. Make no mistake; if you never take the plunge into investing, you're guaranteed to never see any returns. Believing that you have the ability to be successful at investing and building wealth is the frame of mind you should always strive for. Whether you endeavor to develop the skills and DIY your approach to investing, or seek the services of a qualified money manager, believing in your ability to make sound financial decisions will help you move forward. Successful billionaires like Warren Buffett take a long-term approach to investing. "Our favorite holding period is forever," he's quoted as saying. Patience will help you avoid reacting rashly to groupthink surrounding market fluctuations or hyperbolic headlines predicting the end of life as we know it. You may have done some research and found that the stock market's average annual return is 7 percent when you look at any 10-year period. This information feeds your optimism, and therefore you're willing to be patient. And your patience will help you keep a long-term perspective. Since investing success requires a long-term perspective, goal-oriented people tend to have a leg up in this arena. Staying focused on the end goal helps you avoid distractions. Deciding whether you're investing for retirement, to purchase a house, or to save for a child's college fund will determine your best course of action. Setting interim goals, like completing an investing for beginners class or interviewing three financial planners, keeps goal-oriented people on the path to desired results. Do you keep a cool head when everyone around you is in meltdown mode? Do you immediately default to the next steps required in the midst of a crisis? Your levelheaded temperament may easily be the most important personality predictor of success with investing, not your intellect. That is according to Mr. Warren Buffett.